Low Pressure Boilers is the leading resource for preparing for low pressure boiler operator and facility operating engineer licensing. 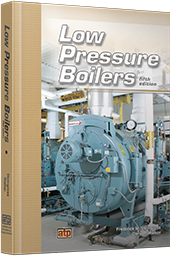 This textbook provides a comprehensive overview of the latest information on the safe and efficient operation of low pressure steam and hot water boilers, cooling systems, and related equipment. Each chapter is divided into sections to aid comprehension of key concepts. To assist with preparing for a licensing exam, a separate chapter with test-taking tips and a sample exam is included.